When we’re sorting out who’s going to do the introduction for our Club films, the committee are always aware that talking too much about the film content is likely to reduce the enjoyment for some of the audience. All I’ll say, therefore, is that The Angels’ Share takes a fairly light-hearted look at how one young father finds his way forward from a deprived background and a potential criminal future. The film is, however, directed by Ken Loach, so I’m sure we’re in for both a treat and a moral somewhere. In my teens, until I found I’d have to work for virtually nothing, I seriously thought of a career in stage management. Thus my interest in films, apart from the odd exception like films starring Brigitte Bardot or Sophia Loren, has tended to concentrate on the technical aspects. Ken Loach first came to my attention in the 60’s when I saw Kathy Come Home on TV, shortly followed by Poor Cow. At the cinema. I’d recently moved to Hampshire after living near Brixton in South West London for a few years, & felt that Poor Cow could have been filmed about areas and people I’d known and lived among. Then Kes came out shortly afterwards and I knew that Ken Loach was a name to look out for. Although Kes was set in Yorkshire, I’d been raised on the edge of Dartmoor and I’d raised a young Buzzard from a chick to later release it into the wild. I felt that the film was talking to me personally. I still rate it as one of the best films I’ve ever seen. His output since the late 60’s has been steady, with most of the next decade spent in TV work before coming back to mainstream cinema with films like The Gamekeeper and later Land and Freedom – one of the best films about the Spanish Civil War I’ve seen. These were followed by films like My Name is Joe and Sweet Sixteen, which may more familiar to modern audiences. In the course of his career, he has been nominated for 2 BAFTA’S, won 73 other film awards and been nominated for a further 51. Some of you may remember The Wind that Shakes the Barley – our May presentation in our first season as a Club. I tried unsuccessfully to get Route Irish onto one of the voting lists last year. Several members suggested The Angels’ Share for inclusion towards the end of last season and when we put it out to the vote, it received nearly double the number of votes of the second film on the list. I’m really looking forward to tonight’s film. I’m sure it’s going to be a cracker. I hope you all enjoy it. The Angels’ Share received a wholeheartedly positive response. Firstly through the laughter filling the auditorium and and secondly through the smiles as everyone left the screen. Many were intrigued by Ken Loach’s change of style, comment was passed by those used to Loach’s totally uncompromising style and ‘unusual for Loach’ and ‘not quite what I was expecting’ featured on the feedback forms, pleasingly any of the seemingly doubtful sentiments were all backed up with 4’s out of 5 as the film’s charm and character won people over. 4 was the average mark given but a couple of 5’s were awarded accompanied by enthusiastic expressions of ‘Fabulous!’ and ‘excellent’. Of course being a Loach film he didn’t shy away from social issues and comments such as ‘a good mix of funny and serious’ recognised some of the issues Loach wanted to address but the very positive ‘entertaining’ and ‘very enjoyable’ comments showed it wasn’t overbearing in its portrayal of social issues. As well as a great feature film, this night includes something very special. Jonathan, born and brought up right here in Andover, trained at Drama Centre London and as an assistant director at the National Theatre and Royal Shakespeare Company. He was resident director at Sheffield Theatres from 2010 – 2011 having been awarded a Regional Young Theatre Director bursary. His theatre directing credits include: The Village Bike and Happy Days (Sheffield Theatres); Krapp’s Last Tape and Spoonface Steinberg (Hull Truck); Moscow Live (HighTide); Father’s Son (NT Studio); Mojo Mickybo (Arcola Theatre/Trafalgar Studios); That Face (RWCMD); Maratona de Nova Iorque (Teatro Oficina, Portugal); Even Rats Can Tapdance (Royal Court International Residency); Observations (Theatre 503 at Latitude) and The Freelancers (Old Vic New Voices 24 Hour Plays). The Send Off is Jonathan’s first film. It was part of the official selection and competition at London Short Film Festival and Emden International Film Festival. Please note that the film has not been submitted to the BBFC for a classification. It has however been reviewed by Test Valley Borough Council and approved for screening. They have asked us to publish this statement: “children are admitted but some scenes may be unsuitable for young children”. An audience of over 60 welcomed Johnny Humphreys and the presentation and Q&A of his short film ‘The Send Off’, ‘great film’ was the most common response when asked for their view, the performances and the sensitivity of his film were praised as ‘thought provoking’ and ‘very good’ by the attendees and Johnny’s account of the process of filming and directing fascinated and added real depth and understanding to the work. Your Sister’s Sister didn’t receive as positive a response as the short, chosen as a companion piece by the committee opinion was slightly more divided, undoubtedly there were many laughs raised throughout the film and the naturalism of the performances were complimented by many but a couple of members felt the film was a touch ‘light’ in terms of approach and content in contrast to previous films screened. Most were charmed though and left the auditorium with a smile on their face, mainly down to the ‘amusing ending’ which closed the film and an enjoyable evening. No Introduction was given this evening as The Send Off and a Q+A session took precedence. When we sort out who is going to introduce a film each month, we try and pick a speaker who has some connection to the film or its content. In this case I was volunteered because I speak fluent Chinese. I can’t understand it, and written Chinese looks like squiggles, but allegedly I can speak it. It happened like this. I was on holiday in the West Country with my son and his family & one evening before retiring, I purchased a Chinese takeaway, which we all consumed, myself enjoying few beers as well. I don’t know whether it was the beers or the spices used, but unusually that night I woke Vi (my good lady wife up) by talking loudly in my sleep. She listened with interest – as you do – but to no avail, because, as she told me next morning I was talking fluent Chinese. As Vi has no more grasp of Chinese than I do, you’ll have to take my word for it, but from then on I have been able to claim to be bi-lingual. Tonight’s film is set in Hong Kong and is directed by Ann Hui who is very well known in Asia, but has only recently come to the attention of film audiences in Europe. Tonight’s in the last of a trilogy looking in detail about the complexities of family life in Hong Kong. From what I know of it, I don’t think we miss anything for not having seen the other 2 films, and I understand that it is warm-hearted film that doesn’t lapse into sentimentality. I think we’re in for a treat. I have been to Hong Kong, and can relate an experience that at least gives an insight into the way of life of some of the Hong Kong people. We went there for a wedding, which took place in St Johns Cathedral on Hong Kong Island in the middle of our 10 day stay. On the first night I woke in the early hours and decided to go out and try and buy some fresh milk – as you do at 3.0 a.m. in a strange city the other side of the world. We were staying near the waterfront on Hong Kong Island, and I knew that there was a 7 –11 which in fact was open for 24 hours a couple of streets away. I walked through some elevated walkways with several little piazza type squares with seats and potted plants – the sort of places that during the day you would expect to find the odd person sitting down taking the air. The only thing was that everywhere that I passed with available seating was occupied with predominantly elderly people, plus a few very young children in buggies etc. They were talking, reading, playing chess, feeding babies and I’m sure doing other things that I didn’t notice. The next day I commented on my experience to my friend Mike who was soon to get married. His response was very relaxed and factual – Oh yes they’re “hot-bedding” – an expression I’d not heard before. As Mike said, Hong Kong has an awful lot of people, and although you don’t see the dreadful slums & shanty-towns that you may experience elsewhere in the world, when people are poor in Hong Kong, they have very little room to live in. All of the family – sometimes up to 5 generations – may have to share one room and possibly one bed. As soon as the bed is vacated by one person another takes their place – hence the bed never gets cold, or the expression “hot bedding”. During the night, whenever the weather makes it possible those who can’t or don’t have to work, go out to meet friends in similar circumstances to reduce the crowding of the accommodation. The people I saw in my early morning stroll were filling in time to let those of their family who needed to sleep at that time get a better chance of a decent sleep, by going out. From the feedback I received at the time, a very common practice in Hong Kong and many other oriental cities, and I must admit I viewed the relevant commitment to family harmony involved very touching. From what I read about tonight’s film & its relation to family life in Hong Kong, what I experienced was typical of the Hong Kong lifestyle that Ann Hui is portraying. 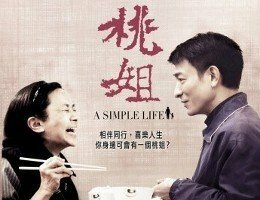 A Simple Life garnered much praise from the audience, ‘very enjoyable’ was the overriding comment that came through immediately balanced with mention of the honesty and sensitivity that director Ann Hui injected throughout the piece. Mark’s introduction was mentioned as ‘appropriate and engaging’ as he set the scene for us recounting his experience of witnessing street and family life in Hong Kong, his words led us to a very considered film with a low-key approach, presenting us with a warm and delicate tale of sacrifice and family taking great care in exposing us to aspects of growing old never once becoming sentimental or shying away from the issue. It’s surely a mark of this unique film that it not only gained top marks, 4pts being the minimum score but could elicit reactions from members which seemed immediately contradictory, comments such as ‘sad film, yet entertaining’ or ‘very appealing, sombre though’ go some way to encapsulating the deep richness of the story and the multitude of emotions the film skillfully touched upon from the moment it began to its final frame. I hope nobody has come this evening for the plot, because there isn’t one. Tonight’s offering is a visual feast. It’s for those of us who enjoy Cinematography – the art or technique of movie photography. We’ve all been wowed by the BBC, especially some of the amazing camerawork in those David Attenborough series. You could almost be there. But tonight will be better than ‘being there’. For just over an hour and a half we’ll be looking at enormous landscapes, lingering details and time-lapse shots through the eyes and thoughts of a master cinematographer. Ron Fricke has made a number of beautiful and thought-provoking films. He was the director of photography for Koyaanisqatsi (1982) (which means ‘Life out of balance’. He also directed other purely cinematic non-verbal non-narrative features Chronos and Baraka (1992). Samsara is a sequel to Baraka. The theme is based on its translation from the Sanskrit language. Literally meaning “to flow on” through the cycles of life and thus the “ever-turning wheel of life,” and explores the interconnections between cultures and societies around the globe. It was filmed over 5 years in 25 different countries. Fricke designed and used his own camera equipment for Baraka using a 70mm format, producing the extremely high definition wide-screen image used in Samsara. Samsara premiered at the Toronto International Film Festival in September 2011 and had its U.S. premiere on August 24, 2012. The images may stay with you long after you’ve gone home. Take away your own message from this. I’m sure it will leave us all with lots to contemplate. It’s not often that an Andover Film Club audience are moved to applaud a film especially one without any actors, dialogue or evident plot but Samsara had the power to do just that. With thoughts gathered this non-verbal documentary was enthusiastically praised via the feedback forms, scoring highly it was described as ‘spellbinding’, ‘stunning’ and ‘breath taking’ and any ‘thought(s) it was going to be beautiful but sterile’ were cancelled out by the ‘mesmering’ and ‘hypnotic’ imagery. The combining and contrasting of opulence and poverty in both the spiritual and material sense led to a ‘thought provoking’ evening for all as it was classed as ‘a memorable film’ and a ‘visual treat’. Director Ron Fricke’s technical ability and creative flair was evident from the first frame and the audience ‘didn’t miss the (lack of) dialogue at all’ as this ‘wonderful film’ spanned East to West ‘highlighting the inequality for man and beast’ to the point of, for one viewer, being ‘fascinating but overwhelming’ as the modern world and especially the food and technology industries were put under the microscope. There was one dissenting voice that proclaimed the film as ‘rubbish’ with the direction and editing criticised but it was nonetheless acknowledged as a ‘sensual delight’ by the same reviewer who obviously wasn’t totally enamoured by this ‘powerful’ and ‘moving’ film as others were, it was as one person put indeed ‘a privilege to see it on the big screen’. Based on a true story and the book A Second Wind by Phillippe Pozzo di Borgo played onscreen by François Cluzet, we chart the relationship and friendship between di Borgo and his nurse who became known as the ‘devil guardian’ such was the trouble they got themselves into and the laughs they shared. 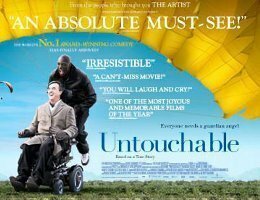 There was no sign of any New Year gloom in the foyer as an audience of over 100 turned up for Untouchable, expectations here high beforehand and were met wholeheartedly judging by the comments recorded. The film began on the roads of Paris with a burst of energy which appeared to set the pattern for the rest of the evening. ‘Wonderful film!’ ‘Very enjoyable’ and ‘Ace!’ were some of the positive comments that almost leapt off of the feedback forms. The upbeat outlook of characters Phillipe and Driss were reflected in the marks given and 5/5’s almost swept the board with one enterprising viewer doctoring their form to give the film a 10 adding they were ‘so glad (they) came’, a sentiment echoed by many at the end of the night. In amongst the scenes of outrageous humour the development of the relationship between carer and patient eventually evolving into a lifelong friendship was proclaimed as ‘very moving’ and ‘thought provoking’ as the story touched on societal and cultural issues in a ‘compassionate’ manner before the audience were thrown into another chaotic situation with the two men embracing the absurd and inappropriate with bravado. There were no negative comments offered as these larger than life characters relished their adventures, the lead roles were ‘very well acted’ never losing sight of the story they wanted to tell, in fact the enigmatic performance of Omar Sy prompted one correspondent saying that they ‘should like to see Driss again’. Writer-Directors Olivier Nakache and Eric Toledano brought us a ‘great film’ which appears to, like the friendship portrayed, have longevity, at least a couple of the audience members had seen it before, one saying it was ‘even better after seeing it twice’ and another finding it still ‘funny and charming’ after a third viewing, ‘ a great choice’. Tonight’s film, Beasts of the Southern Wild, is a low budget independent movie which premiered almost exactly a year ago at the 2012 Sundance Film Festival, where it won the Grand Jury prize. More film festival awards followed, including the Camera D’Or award at Cannes, which is awarded to directors making their first feature length film. The film then went on general release in the US in June of last year to predominantly favourable reviews, and this considerable critical success has culminated in it being nominated for four Academy Awards at this year’s Oscars later on this month. We can be forgiven therefore for having high expectations tonight. The young director who has met with all this success is 30-year old New Yorker Ben Zeitlin. He started making short films in 2008, and during the shooting of the first of these, a movie called Glory at Sea, he moved to New Orleans. It is this coastal area of the state of Louisiana that forms the backdrop to tonight’s film. Its low budget and small team resulted in slow progress, and the movie took three years to make. The female lead is the extravagantly named Quvenzhané Wallis (Kuvenzunay), who is the daughter of a Louisiana teacher and her truck driver husband. At her present age of 9 she is the youngest ever actress to be nominated for an Oscar. Indeed she was only 6 when the film was shot. When she was auditioned she apparently impressed the director with her reading ability, loud scream and her skill of burping on command. The male lead, Dwight Henry, had no previous acting experience. He owned a New Orleans deli opposite the casting agency used by the director and his team, and got to know them when they came over to eat. During a slack period he responded to a flyer they left in the deli looking for budding actors and went across to do a reading himself. To his surprise they wanted to hire him and the rest followed. He has said that on reflection his own real life experience with the extreme weather depicted in this movie enabled him to bring a special passion to the reading. 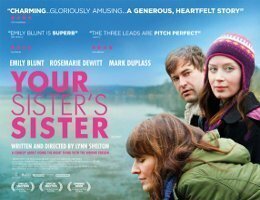 Not only is this the first feature film for the director and lead actors, but also the music is the first feature-length soundtrack for singer-songwriter Dan Romer. It’s truly a movie made by novices. So what is the subject matter of the film? It is based on a one-act play by the young author Lucy Alibar called Juicy and Delicious. She collaborated with director Zeitlin to write the screenplay (needless to say it was her first screenplay). It’s set in a shanty community in a wetland called the Bathtub, remote from the reach of government and the law. The plot incorporates a number of threads: the reality of life in poor communities of the southern US; the impact of climate change and extreme weather, with some obvious parallels to Hurricane Katrina; and then the film has some excursions into fantasy. It’s up to the audience to decide where fantasy begins. We’ll get our chance tonight to see how successfully these threads have been woven together. The majority of critics have been very positive above how this has been done. Regarding the visuals, some have seen similarities to the Vietnam War scenes in Apocalypse Now. The consensus is that the movie works on many levels and in some respects has an almost biblical quality. Barack Obama has described it as spectacular. The minority that have been negative have chiefly focussed on three areas: firstly much of the camerawork is hand held and can become tedious; secondly that the acting of the inexperienced cast is just too amateur; and thirdly that the “mystical” and “fantasy” elements are just cover for an inadequate plot. Let’s see whether we agree with the President! 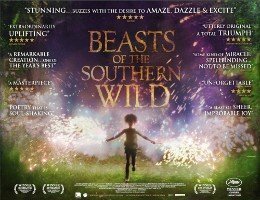 A little piece of the Bayou washed up in Andover in the form of Beasts of the Southern Wild this week and it was met with almost total acclaim. Apart from one feedback form the rest were full of 4’s and 5’s with the 5’s taking it by a snout. ‘Brilliant’, ‘Amazing’ and ‘Visually arresting’ covered many of the reactions. Members felt it ‘surprisingly heartwarming’ and that the ’emotions expressed were very deep’, great pleasure was taken in how the ‘society stuck together and taught the younger generation to survive’. The film’s portrayal of a ‘different side of the USA’ and the nod towards ‘an insight of New Orleans’ brought forth a number of opinions including one believing it ‘extraordinary, uncomfortable but so worth seeing’ and prompted some members to admit ‘We cried!’ In what was judged ‘amazing cinema’ one member thought ‘to describe the film would do it an injustice’ such was its power and another was happy to wallow in the film’s ambiance ‘I may not have seen it had you not shown it. The best thing I’ve seen in a long time’. Just in case anyone was wondering this film has not been produced as a promotion by the Caravan & Camping Club. Neither is it an updated version of the coy Health & Efficiency documentary that I can remember other people talking about back in the 1950’s. But it is a film that contains reference to a caravan holiday. The film was shot entirely in the UK with a predominantly British cast and crew. Most of the location filming was done at Ribblehead Viaduct, in North Yorkshire, but other scenes were shot in Cumbria, Derbyshire and other parts of the North. We can at least look forward to some attractive scenery of the UK. I think to talk more about the content of the film will spoil the fun, so I’m just going to mention some of the main players involved, who are all British and under 45, saying a lot for their potential for the future. The film is directed by Ben Wheatley, initially a short film maker and animator who first came to the public’s attention with an internet clip which went viral receiving over 10m hits. In the 6 years since 2006 he has had more and more success and is now known for his hit film Kill List which was released in 2010. Prior to that film he has also directed several successful shows for various UK television productions and the feature film Down Terrace which was shot in just 8 days in 2009, and went on to win awards at both Austin and in London’s Raindance Film Festival. Sightseers was written by its two main stars, Alice Lowe and Steve Oram with additional material by Amy Jump. The film was chosen in the Directors’ Fortnight section at Cannes last year. Alice Lowe, a graduate of Kings Cambridge, is a well-known actress especially in the UK, mainly for her frequent appearances in a wide variety of TV shows, such as Beehive; Alan Partridge Show; Horrible Histories; Little Britain and so on. Since she started working on TV in 2004 she has been in working every year on one show or another. She played the corpse in the short film Stiffy released in 2005 and she has also appeared in two other feature films, both in minor roles. She was Tina in Hot Fuzz released in 2007 and as a reporter in Ben Wheatley’s previous film Kill List. 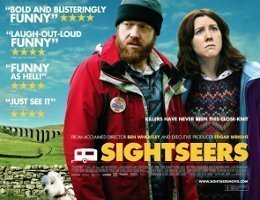 Sightseers is not her first venture into scriptwriting as she has done several of the scripts for some of her TV work and her short film Sticks and Balls was screened at Cannes in 2007. Steve Oram who co-wrote the script with Alice Lowe started in comedy at the Edinburgh Fringe about 12 years back before moving on to do some TV work which more recently included some shows with Alice Lowe. In some of his TV work he composed most of the music. Amy Jump also provided some of the script for the film and has been writing and editing in film for about 3 years. She shared with Alice Lowe and Steve Oram the 2 Awards the film received for the best screenplay at last year’s Mar de Plata film festival and the British Independent Film Awards. She met Ben Wheatley at school in North London and they are now married with a small son. Most critics loved the film although one stated that to describe it as black comedy, was slight understatement. Some have found deeper meaning liking the implied criticism of modern life standards to some of the more profound of Alan Bennett’s work. As I’m currently making hard work reading the latter’s Untold Stories, I really hope that tonight’s effort is lighter than that. Monday’s film was not the quite the attraction it first appeared and consequently brought in the widest range of opinion the Film Club has yet received. The violent scenes portrayed in the film caused two audience members to walk out, one writing that Sightseers was the ‘first film I’ve walked out from. Just too much gratuitous violence’ and it was an issue that dominated the post-film chat. One viewer ‘could not see the point! !’ with another feeling that the choice was a ‘waste of a film night’, both writers giving the film one mark each, another viewer tried to look on the positive side admitting it ‘was funny in parts’ but the humour was ‘too black for my taste’. ‘Wow!’ and ‘Speechless’ encapsulated the shock factor of the film as the same correspondents each offered 4 marks, as did others demonstrating the contrasting opinions on the night. ‘Another surprisingly wonderful film! 5 marks’ wrote one viewer as more positive feedback forms than negative were delivered to the committee. ‘A very amusing film’ voiced one as another enjoyed it considering that there was a Coen Brothers comparison to be made though it was ‘not as good’ as their releases. In the foyer afterwards a member declared passionately that they ‘loathed it’ but the overriding feeling from the audience was that the evident humour and funnier elements of the film were overshadowed by the violence. Tonight’s introduction will be brief as the film is a bit longer than most of our offerings lasting just under 2½ hours. Well we’ve all heard of Salman Rushdie and his book The Satanic Verses which resulted in the “Fatwa” requiring his death, issued by Ayatollah Khomeini of Iran in 1999. As a result Rushdie had to go into hiding for several years. The publicity following the Fatwa probably sold a lot more copies of the book than if it had not been issued, but that theory can never be tested now. What fewer people knew before this film was made, that he had written several non-controversial books prior to The Satanic Verses among them Midnight’s Children which was published in 1981. The book won the Booker prize the year it was published. Salman Rushdie participated in the production of the screenplay for the film and won a Canadian Screen Award for that role. Seema Biswas, who plays Mary in the film also won a Canadian Screen Award for Actress in a Supporting Role. The events described in the book, however, and thus the film, took place in 1947 and the “Midnight” of the title, was I presume the midnight of 14th August as from that time and date independence was granted to the sub-continent and the nations of India & Pakistan came into being. Students of recent history will be well aware of how badly that event was managed by the governing authorities of the time – albeit for the most laudable of reasons – and the widespread and unnecessary death and destruction that followed. Rushdie himself was born in Bombay (now called Mumbai) in July 1947 so it is quite possible that the story has elements of auto-biographical detail in it, as his family were Muslims and living in an area that was imminently to become predominantly Hindu. Like other earlier Rushdie novels, both literary & film critics have used the term “magical realism” to describe much of the content. I think we’re in for a treat. Enjoy the film. Midnight’s Children elicited a very favourable response from Monday’s audience. 5 out of 5’s made up half of the marks offered with 4’s close behind. ‘Brilliant Film’ said one and proclamations like ‘Wonderful’, ‘Excellent’ and ‘Great’ began many of the summaries. The film appealed ‘particularly for those who like India’ and many enjoyed the ‘history lesson and insight’ of the story, ‘I hadn’t realised what was going on at the time’ admitted one viewer and another thought it ‘very educational’. Comparison to Pan’s Labyrinth was brought by one commentator with ‘Its great blend of personal story, real events and fantasy’ and the film’s ‘Fantastic supernatural realism!’ delighted another. There was a ‘minor complaint’ about the pacing of the story and one viewer found the experience ‘a bit obscure’, further reservations were voiced about it being ‘rather long’ and a ‘complicated film’ but it still received 3 and 4 marks respectively but it was without doubt the ‘superb acting’, beautiful scenery and the ‘different outlook’ that won over the vast majority audience on the night. Tickety-boo indeed. 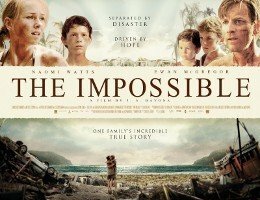 The Impossible garnered positive feedback tempered by the tragic nature of the film. On leaving one member mentioned feeling ‘suitably traumatised’ by the more harrowing scenes whilst a couple of viewers wondered ‘How did they do that?’ with regards to the technical aspects displayed which were rendered impressively. That must have contributed to one writing that they hadn’t ‘been gripped by a film like this in years’, and the scale and tension of the story elicited reactions such as ‘Amazing’, ‘Excellent’ and ‘Great film!’. Further praise followed from others proclaiming the powerful aspects of the tale ‘An extraordinary film’, ‘Very emotional’ with one member admitting it ‘Touched the senses’. 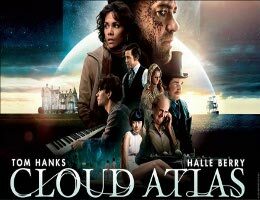 Monday’s audience were transported into a different dimension by Cloud Atlas. All returned safely and the vast majority were delighted by their evening’s viewing hailing it as a ‘brilliant depiction of the book in an unimaginable way’, describing it as ‘A fantastic intertwining of genres’. The ‘Well acted’ and ‘Amazing film’ had some experiencing it for a second and third time and the enthusiasm appeared undimmed, there was acknowledgement it ‘Was a bit difficult to follow’ but it was still thought to be ‘very interesting’. Overwhelmingly though it was the positive comments that won the day, with its ‘Superb cinematography’ and cast and crew displaying their ‘Great…. range of skills’ the audience were left impressed, a first time film club visitor wrote ‘I’ll be back if the films are (all) like these’. We hope to see them and all our other patrons again next month. No introduction was given due to the length of the film. In truth he’s acquired the reputation as a consummate filmmaker with original and thought-provoking material making psychological thrillers such as Swimming Pool, English period drama in Angel, even veering into the musical with 8 Women, often littering the films with cinematic references to other directors but always taking audiences into unexpected and dark places. Ozon’s work commonly challenge the notions of masculinity and femininity, often the boundaries between straight and gay and mixing and varying genre, burying deeper into content and form to explore the barriers between art and life and here exploring voyeurism and complicity, truth and lie. We shall see quite how neurotic in a moment. Monday’s In the House provoked a lot of response scoring an average of 4/5, many thought it ‘Very interesting’ and ‘Thought provoking’, enjoying it but equally finding it to be ‘Challenging’ and occasionally ‘Unsettling’, one viewer thought the darker elements of the story ‘Didn’t always make for easy viewing’ encompassed many points of view. 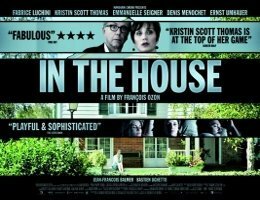 One member hailed it as ‘French film at its best!’ which contrasted with another who thought that ‘Being subtitled and French does not make a film suitable for film club – no edge or point’ in what was by far the most critical comment offered. Perhaps surprisingly the humour in the film didn’t receive a mention specifically even though it had many chuckling especially early on. ‘Well acted’ was another common sentiment offered with Fabrice Luchini playing ‘A very convincing Devil’s Advocate’ and the ‘Composition of a story’ within a story earnt the compliment of ‘A very clever film’ from one feedback form. Amongst the praise for this ‘Very enjoyable’ piece there was an opinion that it ‘Lost its way a bit in the second half’ but the majority felt it ‘Original and fascinating’ and ‘Intriguing throughout’ with one finding room to praise the ‘Great music’. One of our writers was left like (main character) Germain ‘Wanting to know more’.